Brook Trout are one of the most beautiful species of freshwater fish. This magnificent species displays an array of color and is prized table fare. They are sought after by new and experienced anglers alike. The only trout native to much of the eastern United States, the Brook Trout (Salvelinus fontinalis), is a small but spirited fish. American Expedition is proud to present information, interesting facts, and photos of the Brook Trout. Native to the Eastern United States, the brook trout is also known as a speckled trout, a spotted trout, a brookie, or a squaretail. Considered an indicator species, they help show the health of the water. Large groups of trout indicate that the environment in which they inhabit is healthy. A decline in the population is usually a sign of a deteriorating habitat and unsanitary water. Looking for Fishing Home Decor? 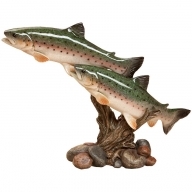 Find unique fishing cabin decor in our wildlife store. A brook trout is greenish-brown in color with a unique marbled pattern of a lighter yellowish color on their back and sides. The marbled pattern fades down to incorporate several scattered small red dots outlined in blue. The belly and lower fins are a pink color, similar to the color of salmon flesh. During the fall mating season, the genders of the fish become more noticeable. This is the easiest time to distinguish the male from the female trout. The male acquires a hooked lower jaw and more vibrant colors, which helps attract females. The male trout also develops a hump on his back. The size of a brook trout is significantly smaller than other trout species. Their size greatly depends on the condition of their habitat, such as the water temperature and food sources. On average, brook trout grow to about 10 inches and weigh about one pound, but those found in lakes usually grow larger, and sea trout grow even bigger. However overall, their short lifespan and slow growth rates contribute to their commonly small size. 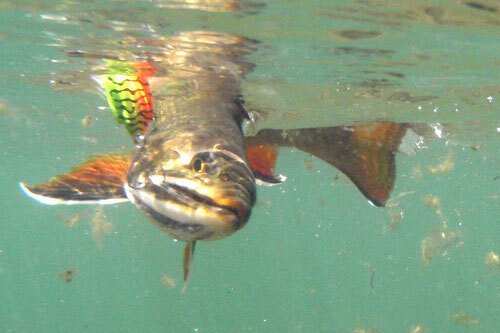 Spawning occurs in the late summer or fall, depending on the water temperature. Trout travel upstream to find perfect grounds with loose, clean gravel and a good supply of oxygen. During this time, the female will prepare a nest along the shoreline, and occupy it until she is ready to express the eggs. When she is ready to release, a male approaches and fertilizes them as they are dropped. The female then buries the eggs in the gravel, and makes a small mound. The eggs stay there through winter until early spring, when they then hatch. The new brook trout, known as “fries”, stay around the nesting spot until their yolk sac is absorbed and then proceed to find shallow water with food and protection. The average lifespan of a brook trout in the wild is 5 years. Egg incubation process lasts about 100 days. Brook trout do better in the wild than in captivity. A brook trout’s average lifespan is about 5 years, but there have been reports of this fish reaching 15 years. Looking for Fishing Wall Decor? 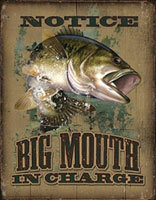 Find unique Fishing Signs in our wildlife store. The female trout can lay up to 5,000 eggs during a spawn. The brook trout is the state fish of eight states. These include Michigan, New Hampshire, Vermont, New Jersey, Pennsylvania, Virginia, New York, and West Virginia. The world record brook trout was caught in Ontario in July 1915. It measured 31 inches and weighed 14 ½ pounds. 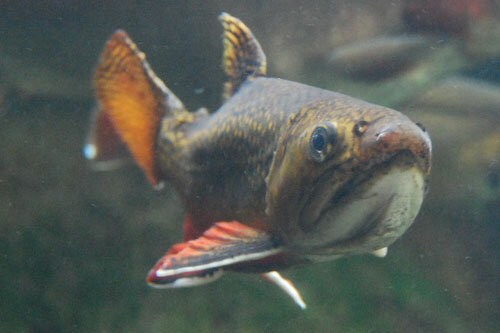 The natural predator list for a brook trout is large brown trout, fish-eating birds, otters, and snapping turtles. Brook trout are located in streams, creeks, and lakes in the Eastern United States and Canada, from the state of Georgia all the way up to Hudson Bay in Canada. Some migrating trout spend time in the sea as well. 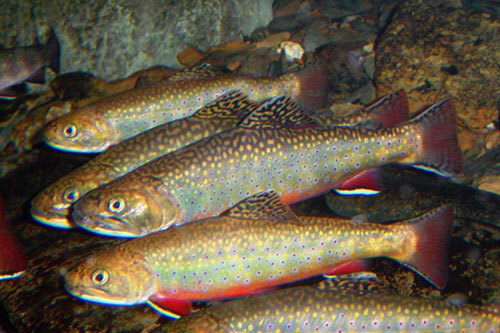 Brook trout thrive in waters with low temperatures, preferably below 68 degrees Fahrenheit, with high oxygen content. Trout can not tolerate temperatures exceeding 77 degrees Fahrenheit. Find Fishing Reel Toilet Paper Holders in our wildlife store. Adult brook trout feed on organisms such as worms, leeches, minnows, crayfish, amphibians, and insects. Young trout feed on plankton and progress to insects until they are adults. The best time to catch a brook trout is early dawn or dusk. Early season trout love to eat aquatic insects. Use artificial flies or live insects as bait. You can fish from the shore or wade in the water. Cast upstream and across from your target. Find the correct fishing reel that you feel most comfortable using. Many advanced fisherman use a fly rod. Look at your state’s regulations to find out when you are allowed to fish. The above video shows brook trout filmed underwater while ice fishing. Brook trout do better in the wild than in captivity. Photo by U.S. Fish & Wildlife Service - Northeast Region on Flickr. A brook trout’s average lifespan is about 5 years, but there have been reports of this fish reaching 15 years. Photo by Heath Alseike on Flickr. 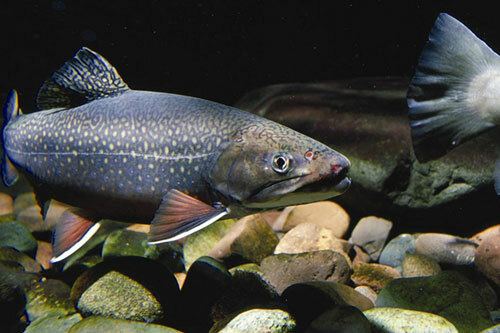 The natural predator list for a brook trout is large brown trout, fish-eating birds, otters, and snapping turtles. Photo by Aaron Gustafson on Flickr. Interested in Fishing Gifts & Decor? Visit the Fishing section of our store!